I’ve owned this for years, lately I’ve been digging in. WKCR has jazz interviews archived (1971?) and NPR’s Piano Jazz also has a fine session with Marian McPartland from 1981. “Alice Coltrane, née McLeod, was born August 27, 1937, in Detroit, Mich. She began studying classical music at age 7. Her family was active in the church, and she played piano and organ for the choir. After graduating high school, she played at various halls and functions around town. In 1960, she took a job as intermission pianist at the Blue Note Club in Paris, where she studied jazz with Bud Powell. After moving to New York in the early ’60s, she played in vibraphonist Terry Gibbs’ quartet, during which time she met John Coltrane. In 1965, they were married in Juárez, Mexico. 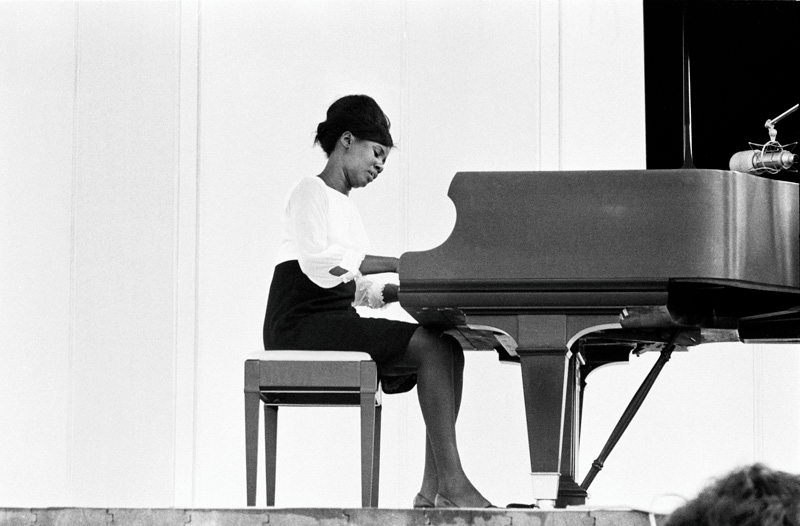 In 1966, she replaced McCoy Tyner as pianist in John Coltrane’s group, and recorded and played with him until his death the next year. John Coltrane became stepfather to Alice’s daughter from a previous marriage, Michele (Miki), and together the couple had three children: drummer John Jr. (1964–82) and saxophonists Oran (b. 1967) and Ravi (b. 1965). After her husband’s death, Coltrane continued to play with her own groups, which later included their children. She recorded several albums as a bandleader, including work with Ron Carter, Pharoah Sanders, Joe Henderson and Jack DeJohnette. Many of these were recorded on Impulse! in the late ’60s and early ’70s. Coltrane was also a devotee of Indian guru Sathya Sai Baba. After moving to California in the mid-’70s, she opened a Vedic center and later Ashram. She changed her name to Turiyasangitananda, though she continued to perform publicly as Alice Coltrane. Alice Coltrane performing with the John Coltrane Group at Newport 1966. Photo: Francine Winham. The interview with Anthony Braxton at WKCR FM. This interview was part of WKCR’s coverage of the TriCentric Festival, centered around the premiere of Braxton’s opera, Trillium J.